Beautiful setting bordering on Lake Travis. 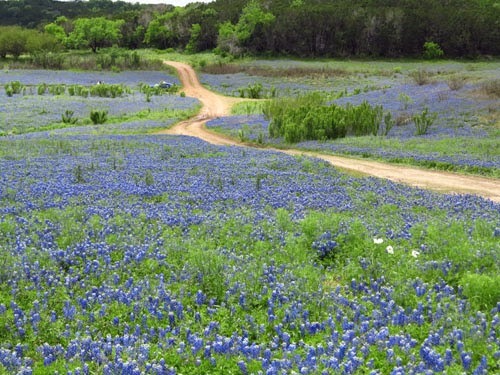 One of the most spectacular displays of bluebonnets in the Austin area can be seen at Muleshoe Bend Recreation Area. 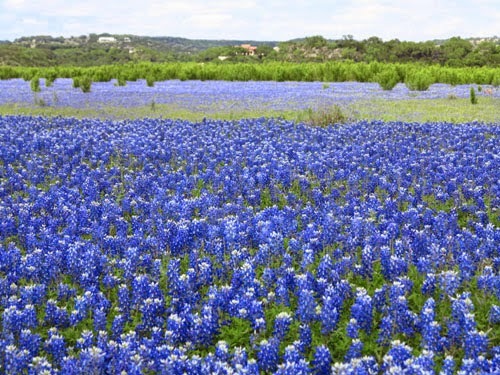 Located on the banks of Lake Travis, fields of blue spread out over several acres of open, flat terrain, creating one of the most stunning wildflower displays we’ve ever seen. 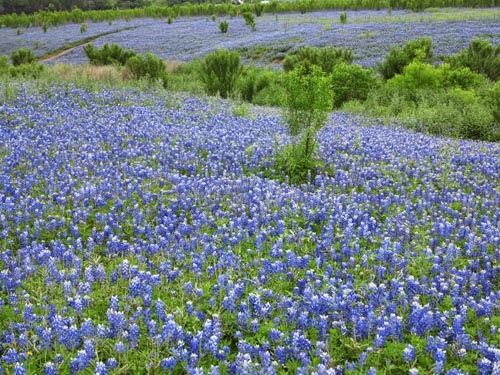 Fields of bluebonnets at Muleshoe Bend Recreation Area. Color contrasts really set off the bluebonnets. Owned and managed by LCRA (Lower Colorado River Authority), the park has year-round recreational options including primitive campsites (many were being used during our visit), trails for horseback riding (which cars can drive on, too), and a 6.5-mile bike trail (not open when we were there). Call LCRA for more information regarding these activities and fees: 512-473-3366. 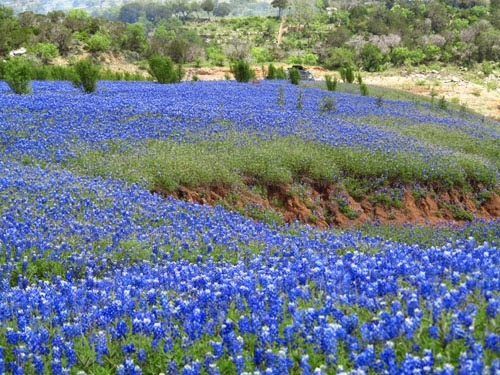 MuleshoeBend is located in Spicewood, Texas, northwest of Austin and south of Marble Falls. From Austin, take Hwy. 71 west, turn right on CR 413, then CR 404, then CR 414, which goes directly into Muleshoe Bend. I hope you enjoy this small selection of photos from our visit. Trails made it easy to meander among the fields of flowers. 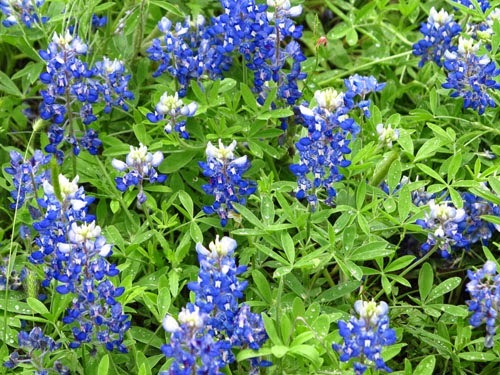 Oh, Beverly, I so love seeing the bluebonnets! I lived in the Dallas area for over five years and looked forward each spring to seeing them and taking photos. 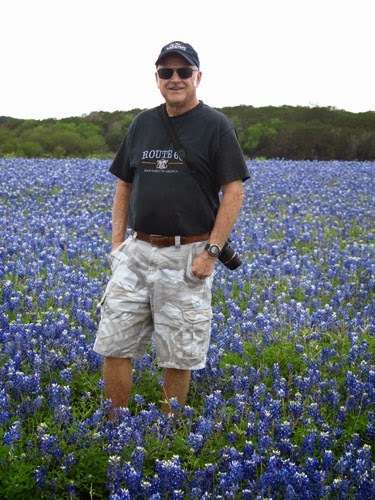 We used to drive south of Dallas to the Ennis area but would love to someday plan a trip to the Austin area and take in all the beauty. I will make a note of this park, in case we are ever able to make it there. Lovely photos! This year has been especially lovely.